Michael May: LXB | He tasks me, and I shall have him! I'm not as much of a collector as I used to be, but I was still able to come up with an answer to this assignment from the League of Extraordinary Bloggers. We all collect something. What is a holy grail item you hope to find at a flea market, toy show, or comic convention? What else do you collect? I used to collect comics, but now I mostly just accumulate them. I don't have particular characters or creators that I follow religiously anymore. In fact, I've lost the collector bug for most everything. I still buy a lot of books, comics, movies, and music, but the difference is that I don't do it anymore with the specific idea that I'm building a collection other than just Stuff I Like. Collecting is fun, but the completist mindset was keeping me from trying new things by forcing me to focus exclusively on things I already liked. Others will have different experiences from mine and that's awesome. I just decided it wasn't for me and the Star Trek and Star Wars novels are a perfect example of why. 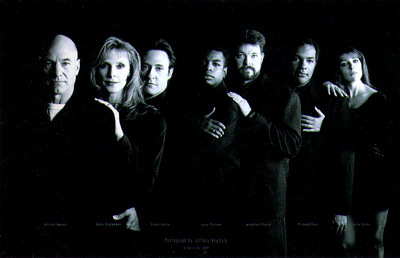 I was a huge Star Trek fan during the Next Generation days and I was still very much a collector. I wanted all the episodes, all the movies, all the books, and all the comics. The problem was that the publishers of the Star Trek Expanded Universe novels knew this about me. I started to realize that in order to keep up with the Star Trek novels (and the same was true for Star Wars), I literally could read nothing but Star Trek and Star Wars novels. I treaded water that way for a while - hoping that the publisher would selflessly ease up on me one day - until I finally read an interview with one of the Star Trek editors who explained that keeping me focused purely on her novels was exactly the plan. They were never going to let up; so I quit cold turkey. Same goes with anything else that threatens to eat up all my resources and leave me no time to explore new things. Having said that, there is one collection that I started years ago that I'd love to complete. During the last days of Star Trek: The Next Generation's influence on pop culture, I went to a Star Trek convention and bought the poster at the top of this post. And since Michael Dorn was at the show (Worf was always my favorite), I had him sign it. And I thought, "Wouldn't it be cool if I could get everyone in that picture to sign it too?" It never happened, so that poster is still rolled up in a tube in my office somewhere with Michael Dorn's lonely signature on it. Even though the days in which I'd hang up a Star Trek poster in my office are long gone, I'd totally put it on the wall if it had all those autographs on it. Too bad I wasn't in Calgary last weekend. If I'd known about it, I seriously would have tried to make that happen. I forget how much I loved that show until stuff like this reminds me. The rest of the League mentioned some cool stuff that they collect, but a few of them especially crossed over with my interests. Pendragon's Post wants a cool Wonder Woman villain toy from the Linda Carter show. Lefty Limbo wants an awesome Space: 1999 ship. Toyriffic wants a giant-sized Rodan toy. LXB host Brian from Cool and Collected wants a wind-up gorilla (and who wouldn't?). The Lair of the Dork Horde wants a Weebles Haunted House (My brothers and I totally had that as kids and I have fond, but frustrating memories of trying to integrate it with our extensive collection of Fisher Price Little People playsets). And finally, Flashlights Are Something to Eat reminds me yet again of how wonderful a show Mister Rogers' Neighborhood was. Do you collect anything? Are there holes in your collection that you're eager to fill? I have a Warrior's poster like that. Currently I have Vermin, Chochise, Snow, and Mercy. I'd love to get James Remar and Michael Beck on there. I'm missing the guy who played Cowboy too. Someday hopefully. - The silver wolf's head cane from the 1941 "The Wolf Man"
- Bogart's trenchcoat and fedora from "Casablanca"
- A written apology from Joel Schumacher for "Batman and Robin"
This would have been fun to do if THEY BASTARDS HADN'T BANNED ME!!! Cal, no one's banned you. That's not how the League works. It's an open system and anyone who wants to participate can. If you're unclear about how to participate, let me know and I'll be glad to walk you through it.